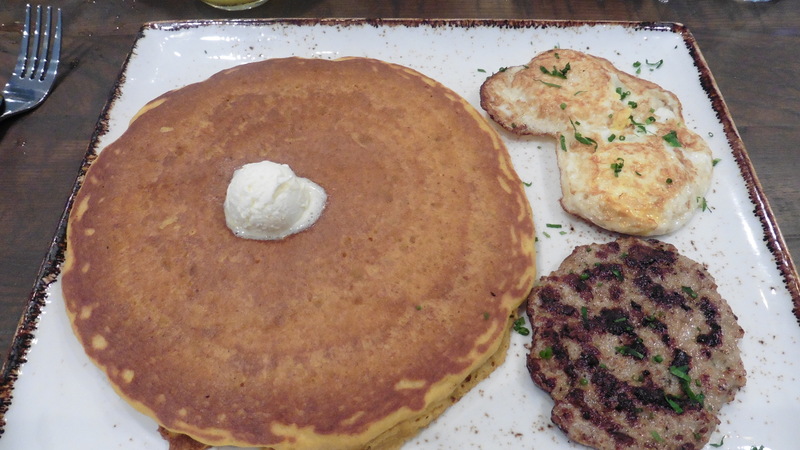 First Watch opened in the Brooklyn area on Riverside Avenue Monday, October 16th. This Bradenton-based chain already has three existing restaurants in the area; Mandarin, Jacksonville Beach and in Hodges Pointe Plaza on Beach Boulevard. The one thing that sets this First Watch apart, it offers Bottle Cocktails and Local Beer. I met with Charles Rohling the Regional Marketing Manager as well as Shane Schaibly, Corporate Chef VP of Culinary Strategy who gave me the grand tour then treated me to a few of the chef’s favorites. 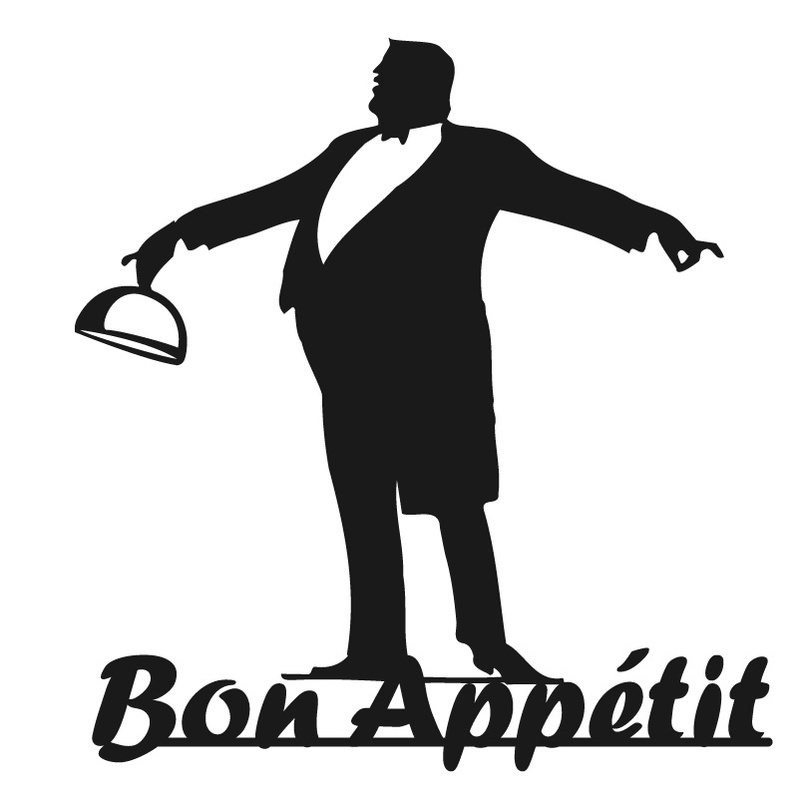 Since I have eaten at the other locations, I was somewhat familiar with the food but was in for a pleasant experience as the dishes arrived. The first two items, Kale Tonic, made with Fuji apples, cucumber and lemon was a most refreshing drink, my other beverage, Morning Meditation a blend of oranges, lemons, turmeric and organic ginger. The combination of ginger and turmeric is a most pleasant jolt to the taste buds. Something not available at the other locations Bottled Cocktails and for sure I had to indulge in those. A millionaire’s Bloody Mary and the twist on a Screwdriver the Morning Glory. 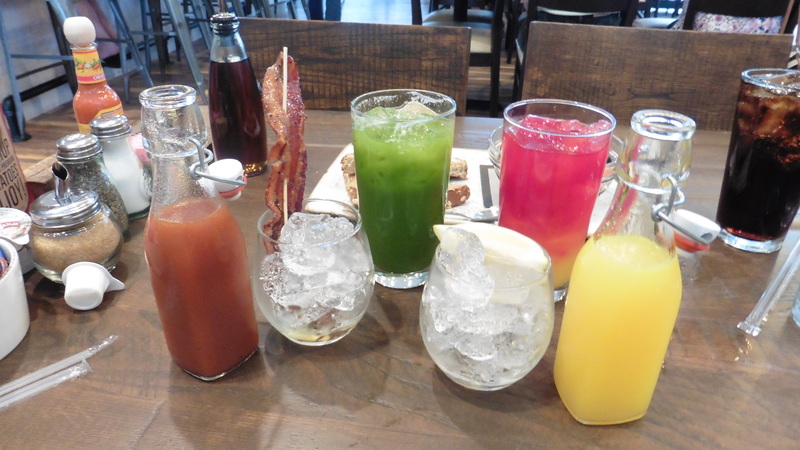 Two things set the drinks apart for me, the bacon in the Bloody Mary is dredged in maple syrup the covered with sea salt, black pepper, and cayenne pepper, then oven baked. The mix used for the Mary is one of the best I have ever experienced. The Morning Glory has the not so secret addition of turmeric, organic ginger, and agave nectar, making this drink to could fall in love with. My next treat Farm Stand Breakfast Tacos; three corn tortillas chocked full with scrambled eggs, Cajun chicken, chorizo and shredded Cheddar and Monterey cheese. 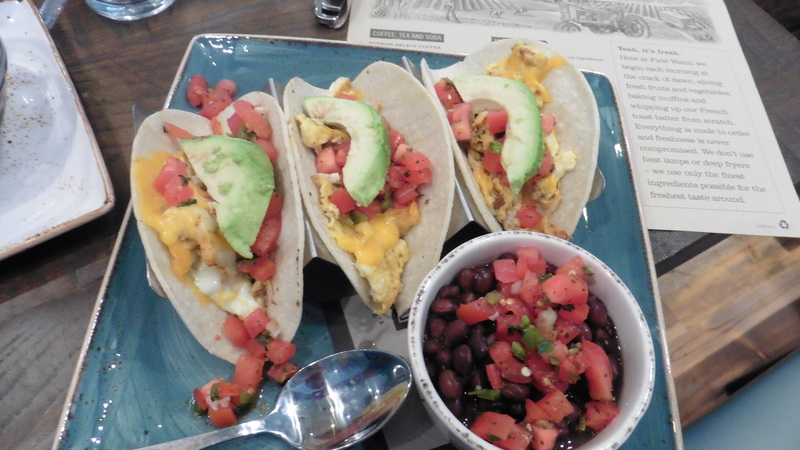 Topped with fresh avocado and house-made pica de gallo served with a cup of seasoned black beans, being a taco fan this dish proved to be very satisfying. Warm taco shells and the well-flavored beans added to the experience. , blackberry preserves and house-made granola. 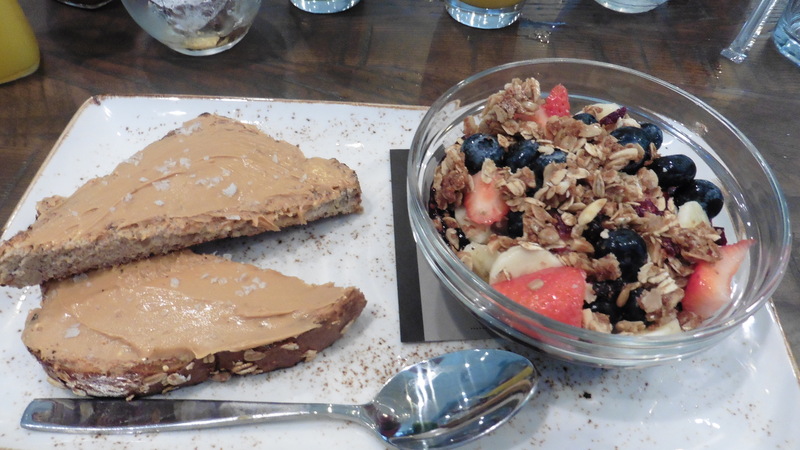 The bowl came with a slice of whole grain artisan toast topped with almond butter and Maldon sea salt. The berries were a large a marbles, the pudding sweet and creamy balanced the crunchiness’ of the granola. My last dish and very timely plus one of my favorites, yep Pumpkin Pancakes, with chicken sausage and two eggs cooked to order. The pancake just about covered the full-sized plate butter melting on the top and within my reach a bottle of warm syrup that arrived with the dish. Delightful is all I can say, I know what I like, and this was it. 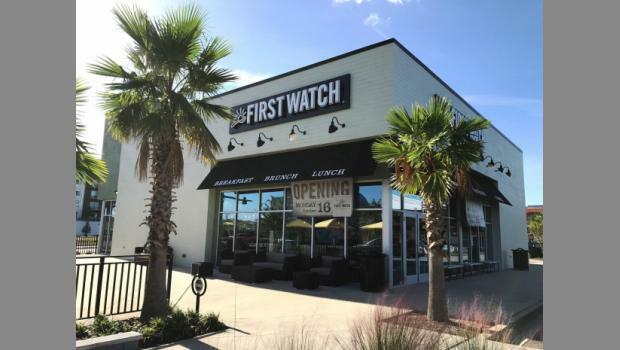 So if you’re a fan of First Watch, I say give this new location a try; especially if you enjoy a little cocktail or a local brew with your meal. I definitely give this Two Thumbs up, for service, quality, and presentation.